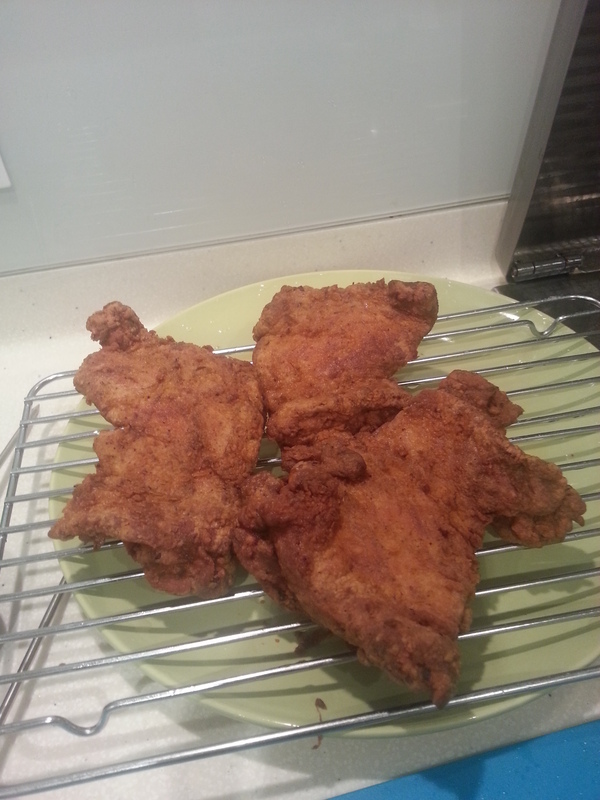 During an epic night of drinks out in Melbourne, our friend Wes mentioned how he has a good recipe for fried chicken and thus a deal was made between him & Holywood. 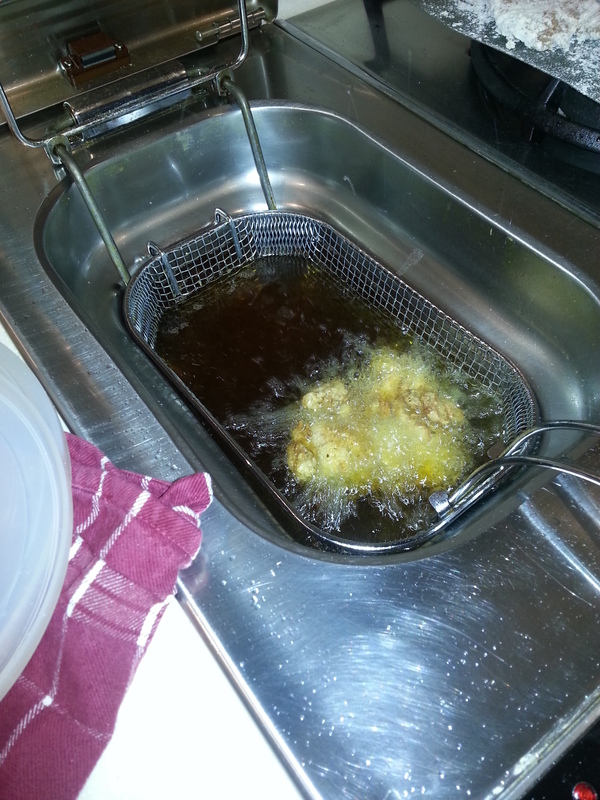 Wes was invited to wreak havoc on our deep fryer and deliver us his famous fried chicken. We set a date and turned over our kitchen and fryer (remember – never deep fry while drunk) to see what magic tricks he could teach us. 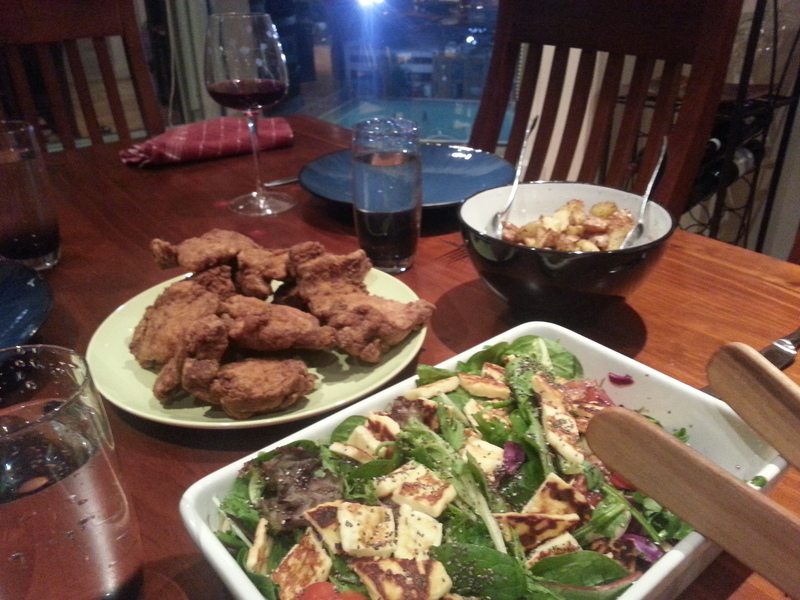 Dizzy supplied the roasted potatoes and a perfectly prepared Halumi salad to complement the main. 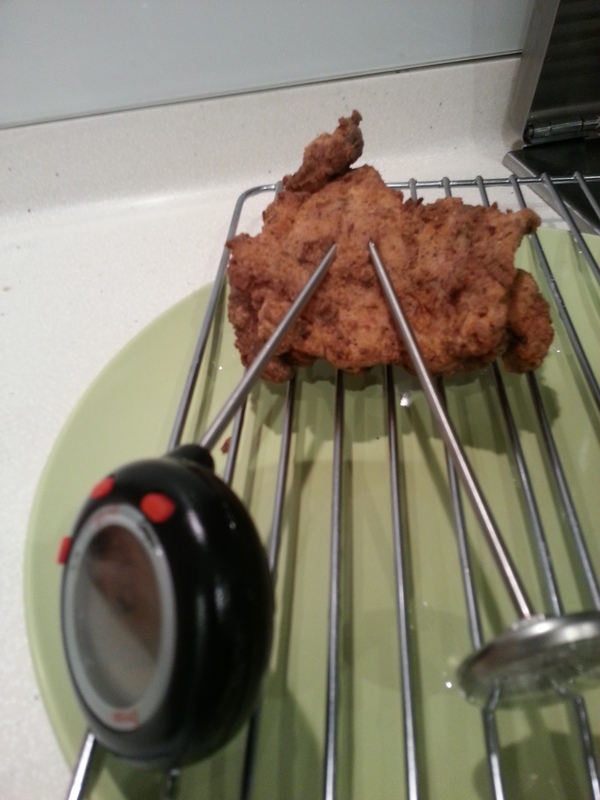 Since we are all extra careful cooking chicken, we may have kept them in the fryer too long. 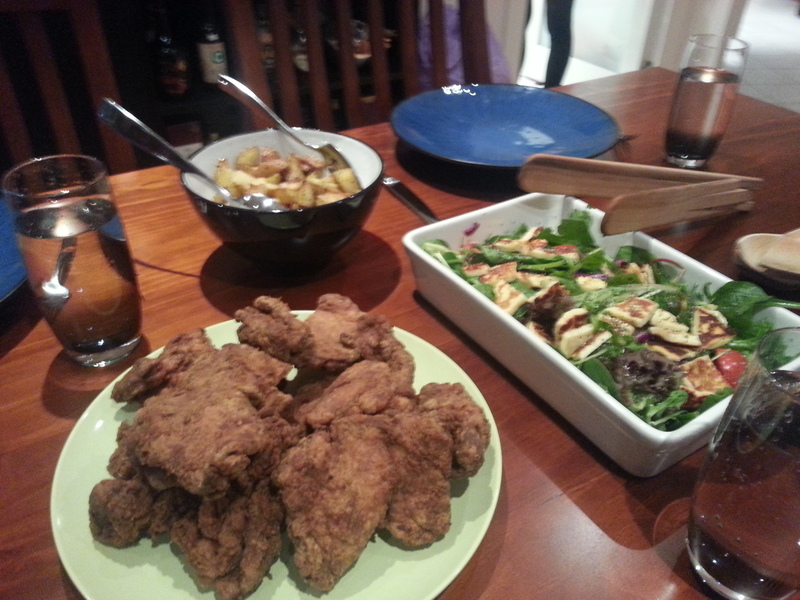 So some of the pieces were just a little bit dry but that didnt stop us from smashing all the chicken. 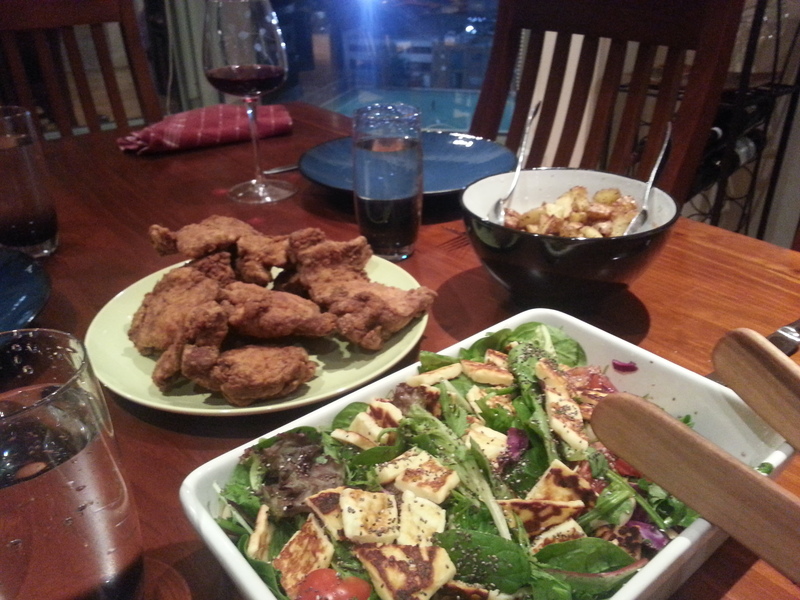 It was fun to get such a wonderful meal from our kitchen without doing a thing! Wes knows his chicken and breading! In this day and age, it’s good to know someone like Wes Chambers, otherwise our fryer would not get the attention it deserves. Wes, we are ready for round 2! This time we can trust the thermometers. Tales of Cookie being Colonel Tan’s big brother threw us off a bit in the beginning, but nonetheless we were focused on our goal of exploring all the top contenders of Melbourne Fried Chicken and Cookie was on the list. We hit up Cookie right after attending a comedy act at the town hall on a Monday night. 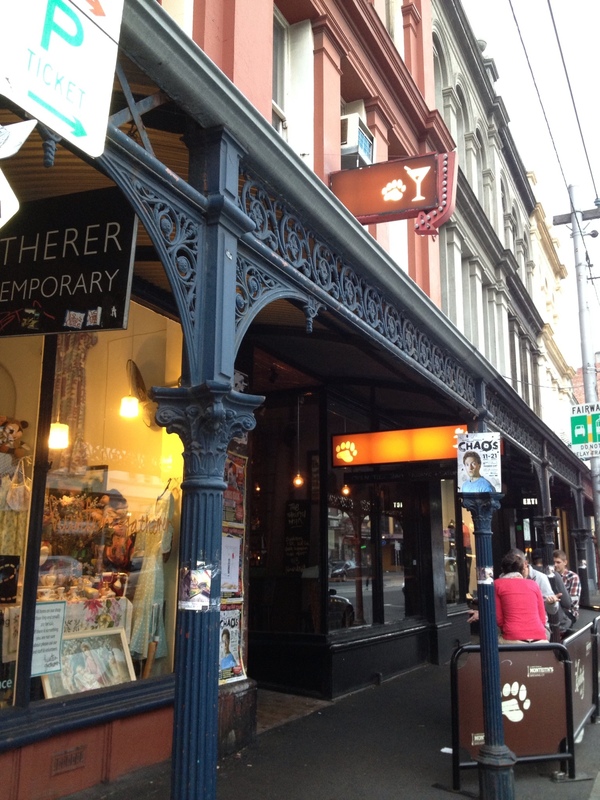 Cookie is located on level 2 of Curtain House on Swanston street. We had tried to get a reservation the Saturday before but were too late, Monday was far less busy but still a good crowd for a slow night. We were handed menus by the very friendly waiter and confusion immediately arose; first the wine list was a tomb that The Chick became immersed in, plus the menus were so big and packed with so many dishes it took a while to find the chicken. 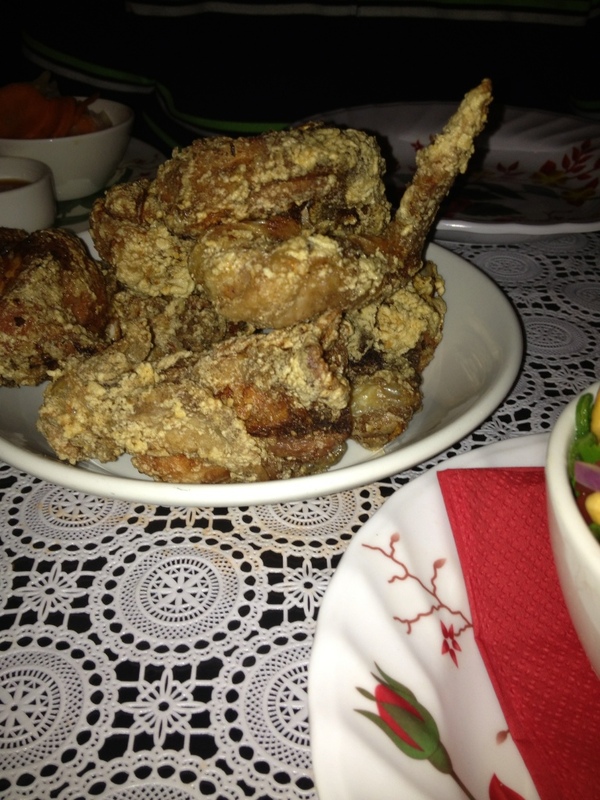 Finally we found it under the large dishes section labeled as ‘deep fried five spice chicken with sweet chili sauce’ and offered as either a 1/2 or a whole chicken. The Chick wanted to do the “feed me” option but knew she wasn’t hungry enough to enjoy it. 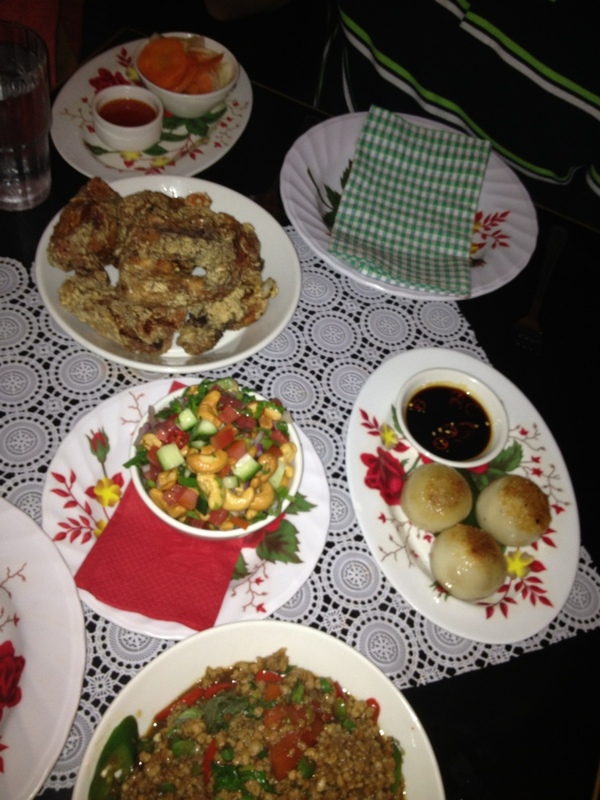 After lots of discussions we finally threw some darts at it and selected: taro dumplings with chili sauce, spicy cashew, tomato, cucumber & coriander salad, the drunken noodles with minced pork & green chilies, and a half serve of the fried chicken. The waiter told us that the half serve comes with 7-9 pieces. The food arrived all at once, re-enforcing the sense of being overwhelmed by food. The Chick didn’t approve of the dumplings because they were too gooey, so the consistency was off in her mind. Hollywood thought they were good enough to eat two. The cashew salad was crunchy, fresh, spicey and very good. 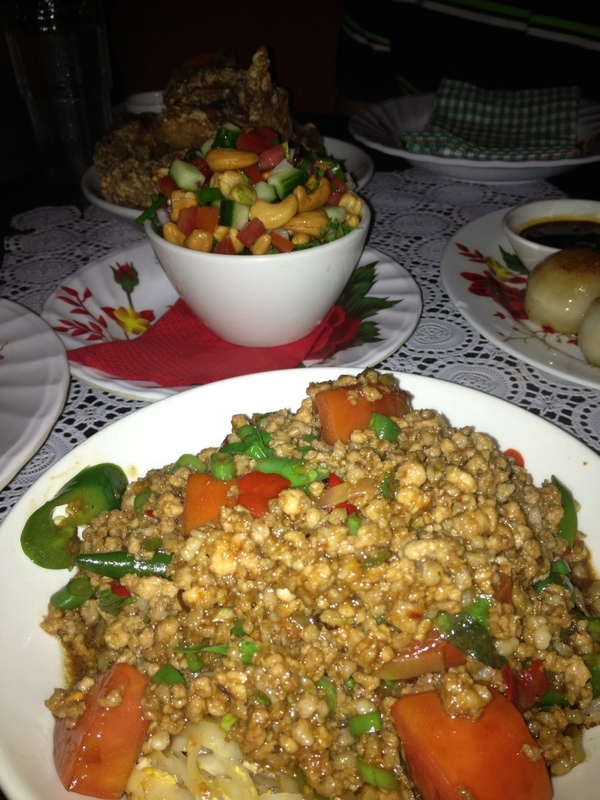 The drunken noodles were a hit, spicy, good texture from the minced pork and good wok fried noodles. Hollywood and the Chick decided that dish was well worth the visit and would be ordered again someday. Last but not least, the chicken came out in a basket of 8 pieces and seemed similar to Korean style chicken (in terms of breading and the way pieces were cut) but more seasoned. The spices were a good blend and had a distinctive taste of cinnamon. Most of the pieces were hot and steamy. The chicken was good but dipping it in the sweet chili sauce added a bit of a kick to it which was a good bonus. The array of dishes provided and the fushion of flavors was an overall good exciting experience. The chicken was good but its not what comes to mind when dreaming of fried chicken because the cinnamon makes us think of a different kind of cookie. The Chick had a work trip scheduled to Sydney, so the decision was made see how Melbourne Fried Chicken compares to Sydney’s. We did an online search and found that a good contender would be Jazz City Diner. We discovered that the diner was closed to add authentic BBQ capability, but thankfully the sister branch Milk Bar was open and serving the essential menu items. It took a bit of effort to find the place (google maps lead us a stray). The Jazz City Milk Bar is on Palmer Lane, Darlinghurst, in a little square with other hopping dining establishments and no signage. It was a small popular place that has most of its seating outside on white plastic furniture. It would have been good to see their main location at Jazz City Diner as it seats more people. Be sure to a make a reservation if you want to sit, especially for the weekend. We were lucky to have two good friends (from the USA) joining us so we could order more than our normal two dishes. The menu boasted many exciting options. After a long discussion amongst ourselves and heaps of consultations from our friendly waiter we ordered the Ultimate Texas chili cheese burger with tortilla crisps, the southern fried chicken burger with creole fries, the macoroni & cheese as a side, and the southern fried chicken and waffle. 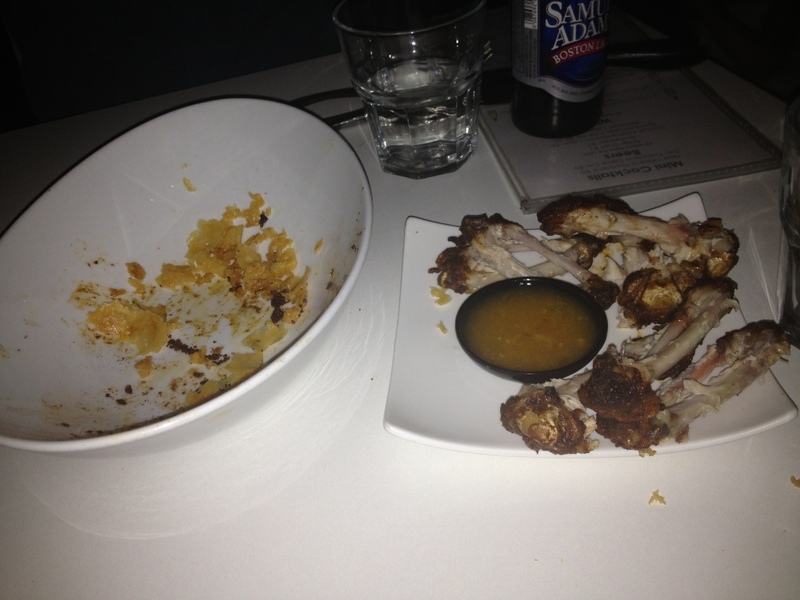 We were on the verge of ordering the Jamaican jerk BBQ wings, with onion rings but held off. The Ultimate Texas chili cheese burger had Texas style spicy beef chili, a beef patty, cheese lettuce, mayo, pickle, relish, guacamole, jalapeño chilies, fried tortilla crisps, and cumin mayo; All the ingredients to make it a sloppy burger that hit the spot. Hollywood felt that the southern fried chicken burger lacked the taste of the chicken breading. 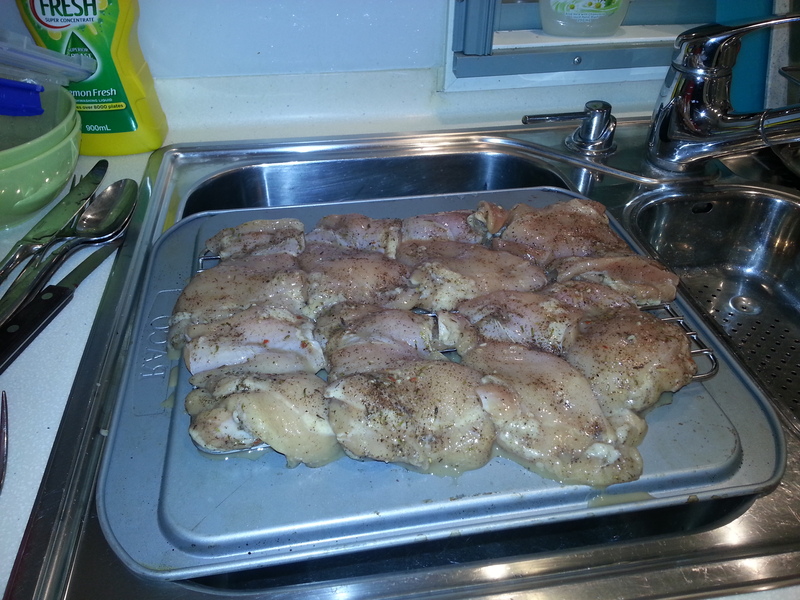 The chicken itself was well cooked, not too dry or greasy and was covered in a tasty tobasco mayo. 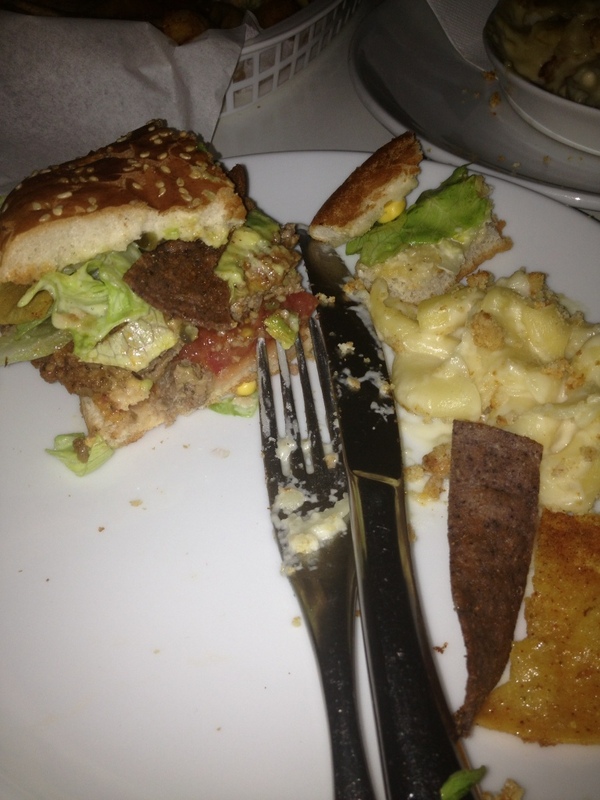 The bun did seem to overwhelm the chicken burger a bit, so maybe a bigger slice of chicken wouldve been better. The Chick isn’t usually a chicken burger fan but found this one above average. Still it was not her favorite item on the menu because of the fluffy bun. The macaroni & cheese was extremely good. It was just a side, but was packed with classic cheesy goodness. 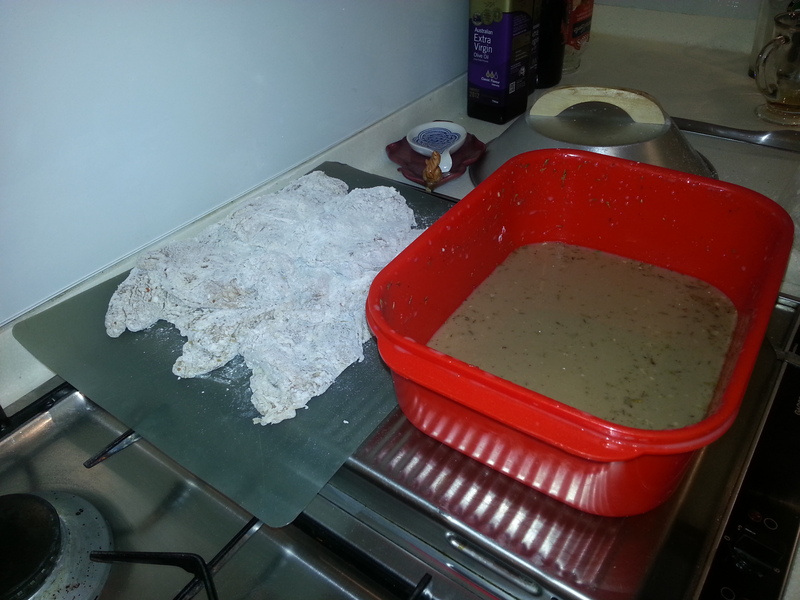 It didn’t have a thick top crust, but rather a sprinkle of breadcrumbs that was given a quick bake. 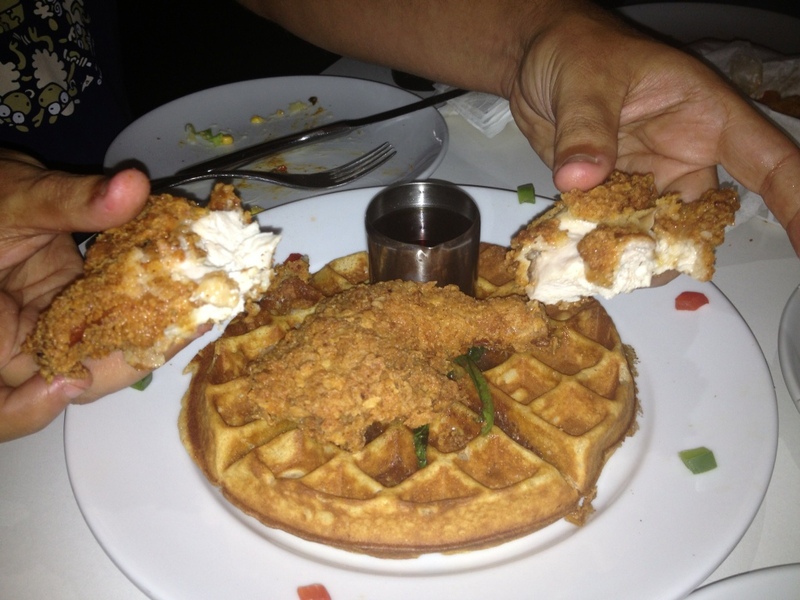 Finally, the main event: The chicken and waffle consisted of two big pieces of chicken which were a thigh/drumstick and breast. The waffle was large and thick and came in a traditional round shape with maple syrup in the perfect little pitcher. The chicken was tender, hot, double coated and had the right crispy crunch. The coating was spicy, but not overly so, Hollywood felt it needed more spice. The Chick embraced the sweet/savory experience and merged the waffle, syrup and chicken bites so she didn’t notice the lack of spice. Since the serving was split 4 ways, we each got only about 3 bites. After the plates were cleared, the flavors were so good, we all craved another taste, and the order of wings we avoided at the beginning was put in. The Jamaican jerk BBQ wings came with onion rings and were delivered personally by the friendly owner. The Chick reckons these were the best rings she has had since coming to Australia. Not too greasy, just the right amount of breading to onion ratio. 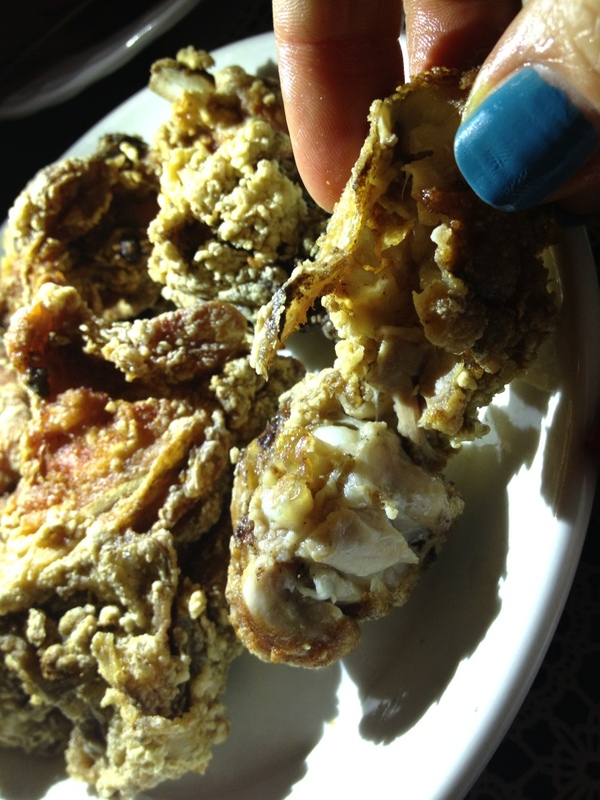 We were so excited to dive in that we forgot to take a photo, and we were so engrossed in the spicy flavor we didn’t stop till only bones and crumbs were left. Finally our friend ordered a shake which he had been craving for months and hadn’t found a proper experience in Sydney yet. Jazz City delivered, but the straw was too small and no spoons were available takeaway. The surprising thing was not feeling to full after a sizable spread. 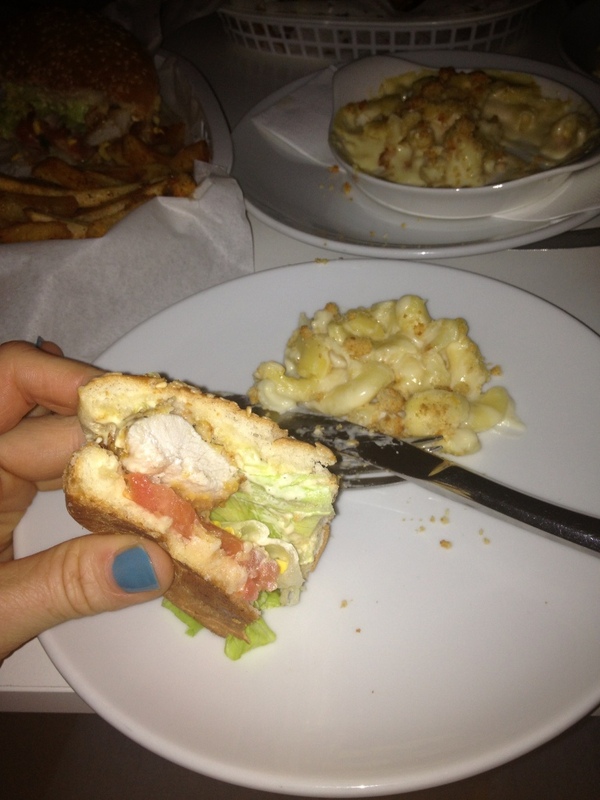 The Chick felt the portions were perfect – not really American sized, but that’s a good thing. 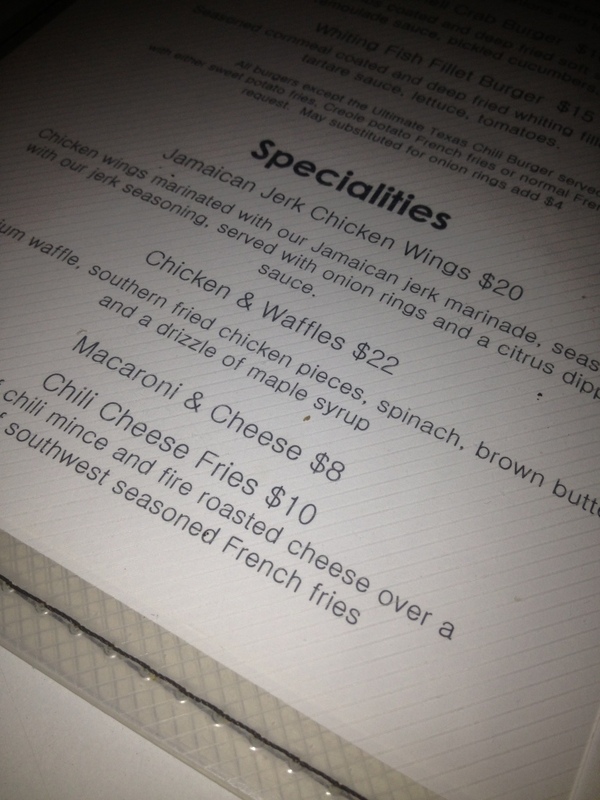 The prices were Australian sized, $24 for a plate of chicken and waffles. But since it was better than your average diner, we have to say it was worth it. 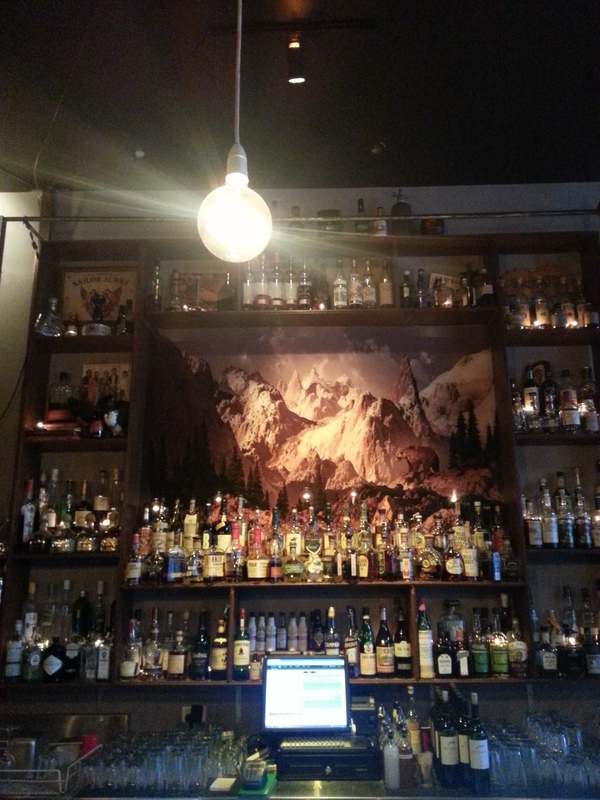 We were full of joy when the owner mentioned that a Melbourne expansion was on his mind. Bring it on, Melbourne needs more diners of this caliber! We have finally been able to review this Kodiak Club, and it has been a long time coming. Whenever Hollywood mentioned The Chicken Scene and how we are trying to put a spotlight on Melbourne Fried Chicken options, someone would always say “You need to try The Kodiak Club” or “the best wings you can find are at the Kodiak Club” would float about. So it was with high expectations that we set out for the Kodiak Club. Where Grizzly’s go to unwind with a good cocktail. Kodiak Club sits on bustling Brunswick St in Fitzroy and is named for the iconic Alaskan Grizzly bear, which are known to enjoy a good chunk of fatty meat, but they are not nearly so picky about the breading as we are. 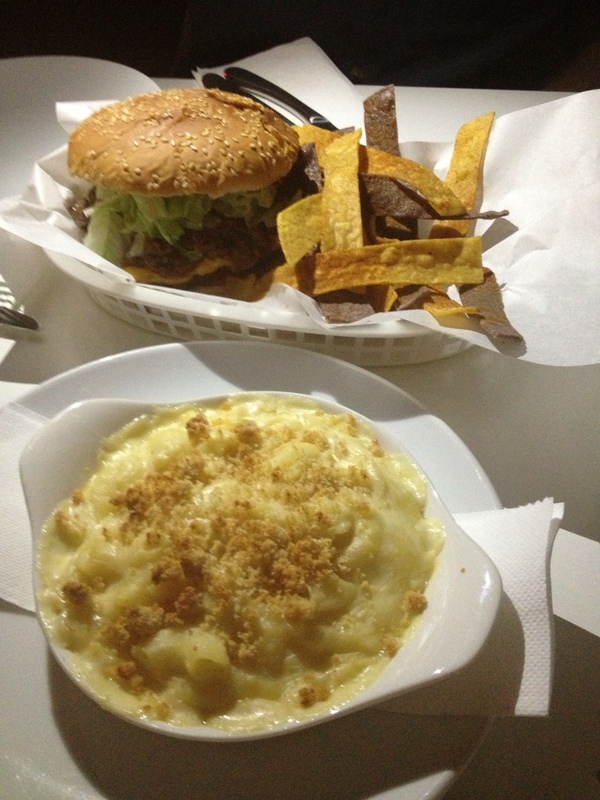 A quick perusal of the American comfort food inspired menu (where is the Mac n Cheese? The Chick wondered) concluded with the following order: Jalapeño Bottlecaps, 3 Deviled Eggs, a half dozen of the Kodiak’s famous buffalo wings, a Kodiak burger, and an order of Chicken and Waffles. 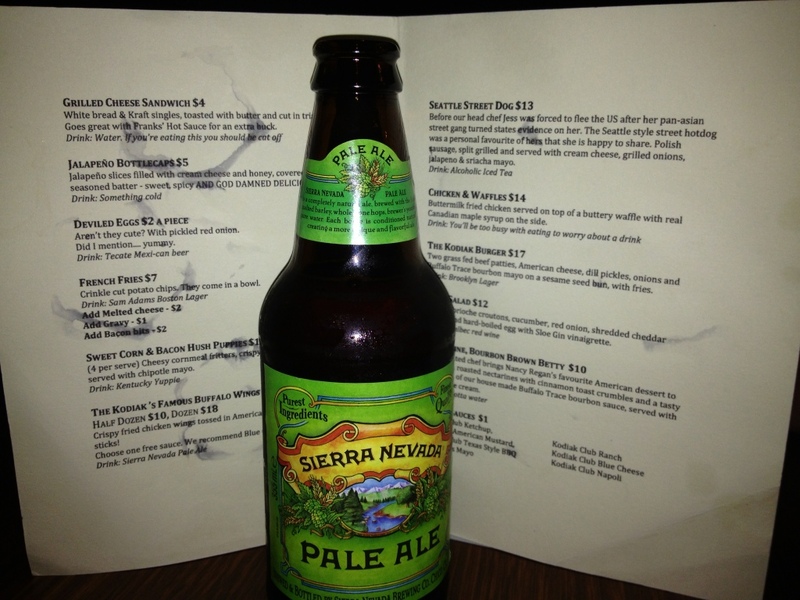 The Kodiak also boasts a good range of drinks and we chose to stick with the American theme; The Chick got a Sierra Nevada Pale Ale, and Hollywood smashed a Brooklyn Lager. Christina ended up with the ‘house white’ when they were out of her preferred wine. 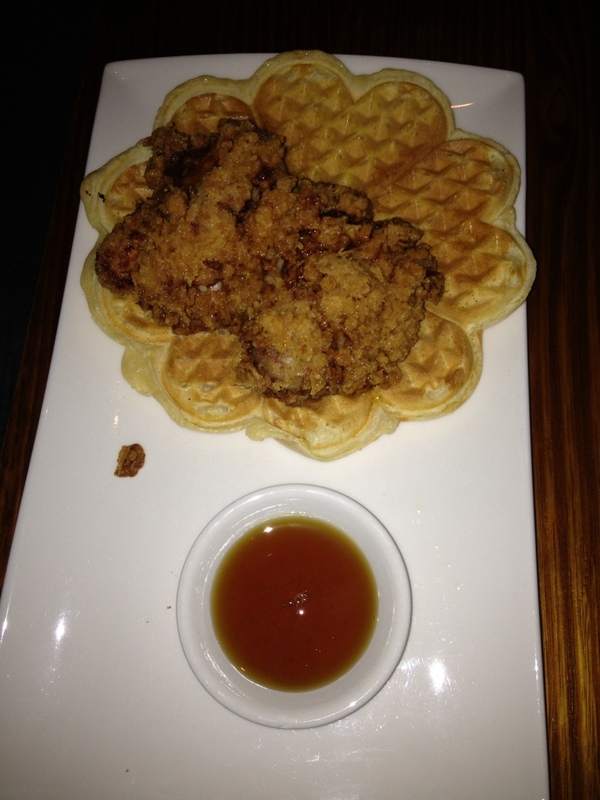 The menu advertised the fried chicken as buttermilk fried chicken served on top of a buttery waffle with real Canadian maple syrup on the side; but Hollywood was worried it wouldn’t be enough. 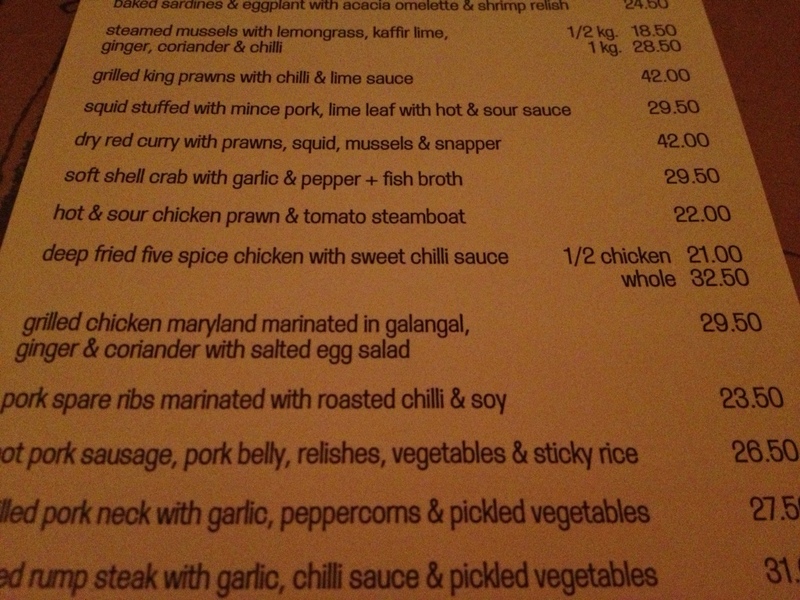 The Chick assured him we could always order more wings or chicken if the portion size was not American inspired. The Deviled Eggs and Jalapeño Bottlecaps arrived first and delighted from the first bite. 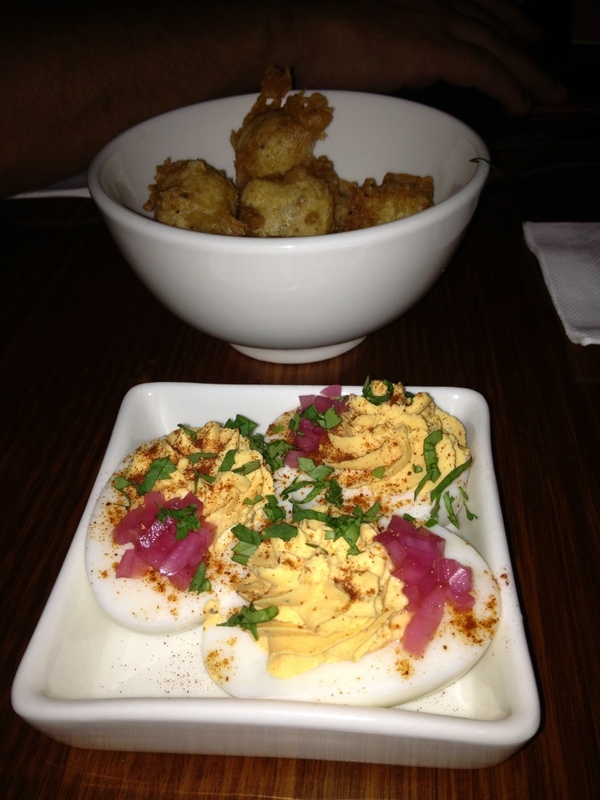 The Chick remembers Deviled Eggs from simpler times growing up on the West Coast of the US, The Kodiak take was a bit more sophisticated with pickled onions and a sprinkle of fresh herbs. 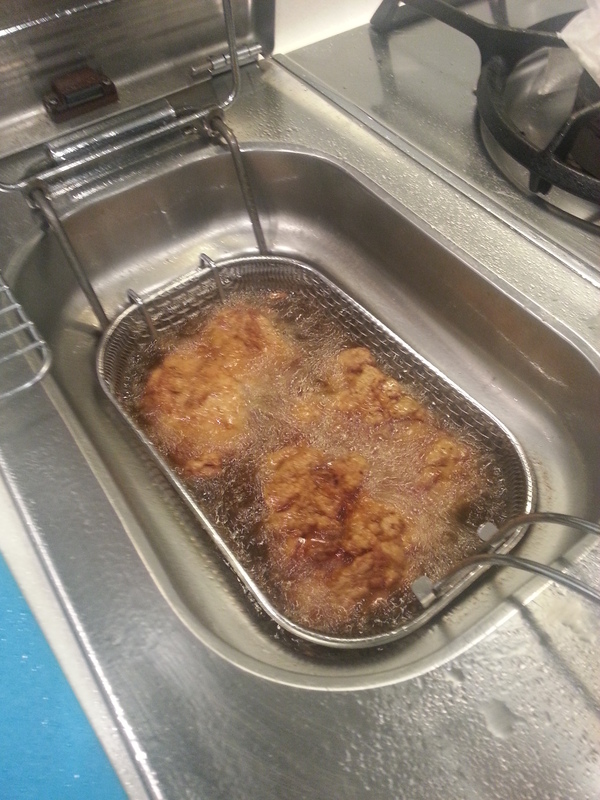 The bottlecaps were fresh from the fryer, and accordingly hot. Unlike the Jalapeño Poppers The Chick was expecting, these little bites had just a slice of jalapeño and the rest was gooey cream cheese, held together by a light and crispy breading. She ate 4 of the 8 pieces. 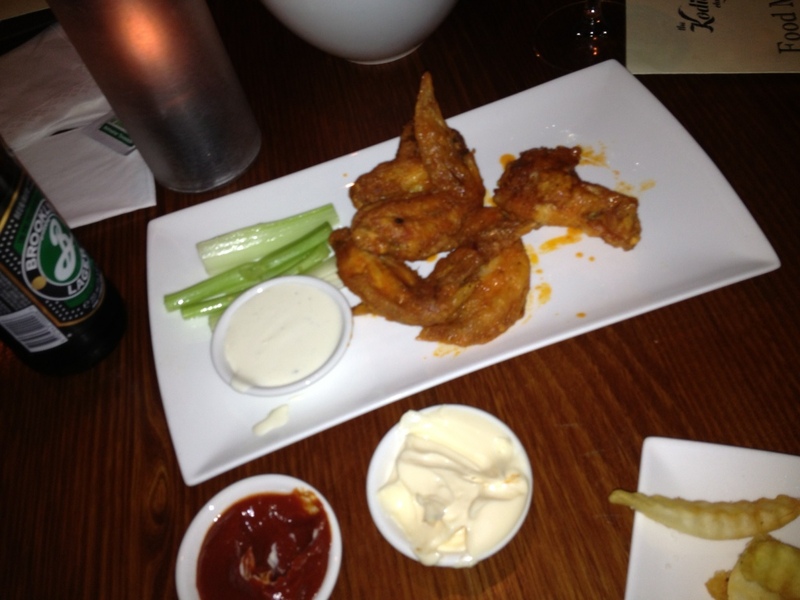 Before finishing the entrees the burger, the fried chicken and last but not least the buffalo wings arrived. 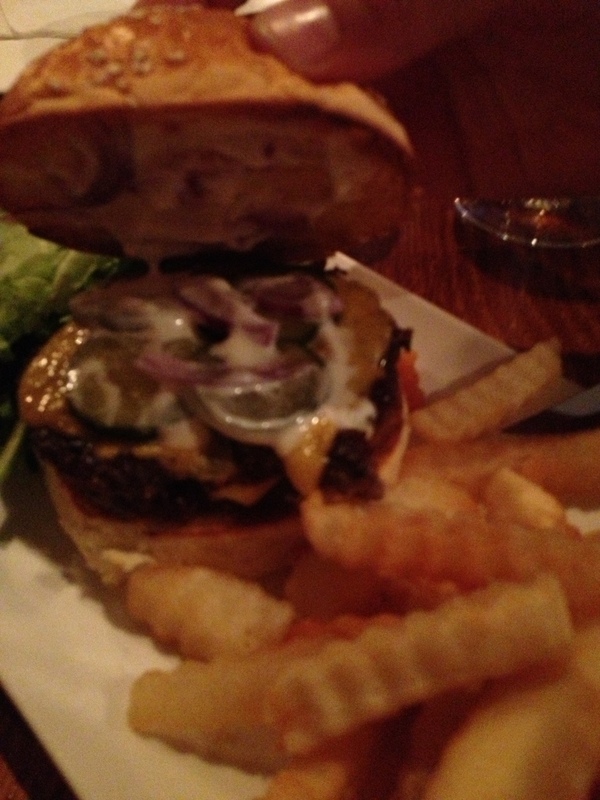 The burger was very juicy and saucy in just the right way. We love saucy burgers. If it doesn’t drip, it isn’t worth the calories. 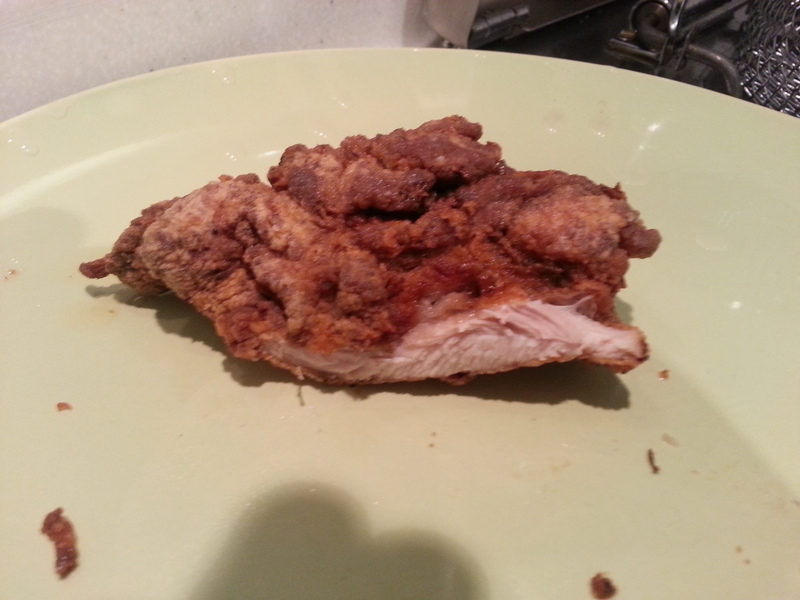 The fried chicken was hot and had a crispy fluffy breading. 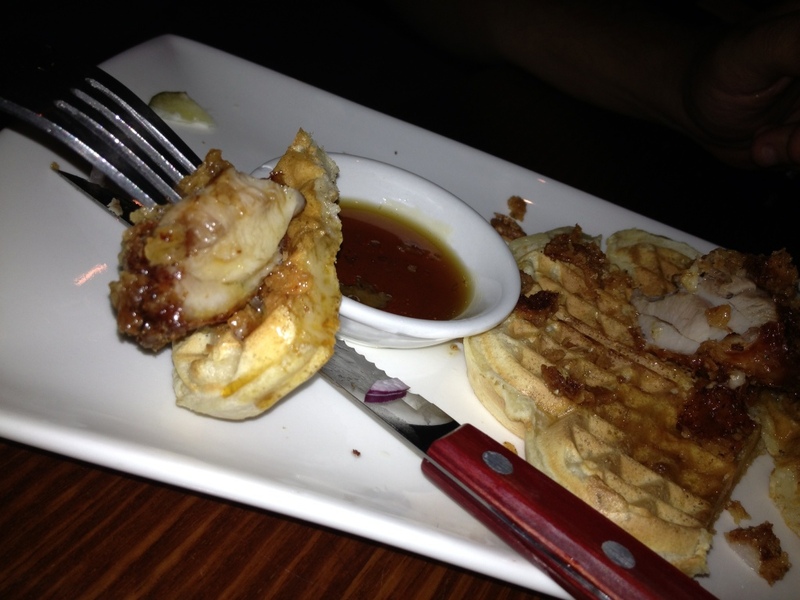 It was a boneless thigh piece resting elegantly on a thin, slightly sweet waffle. It was very well spiced and superbly done. This one was a winner, and definitely more on the greasy than most of our reviewed places. Mixing it with the waffle and the maple syrup gave a good blend of spicy and sweet that made us crave more. Three pieces of greasing delight. One down. 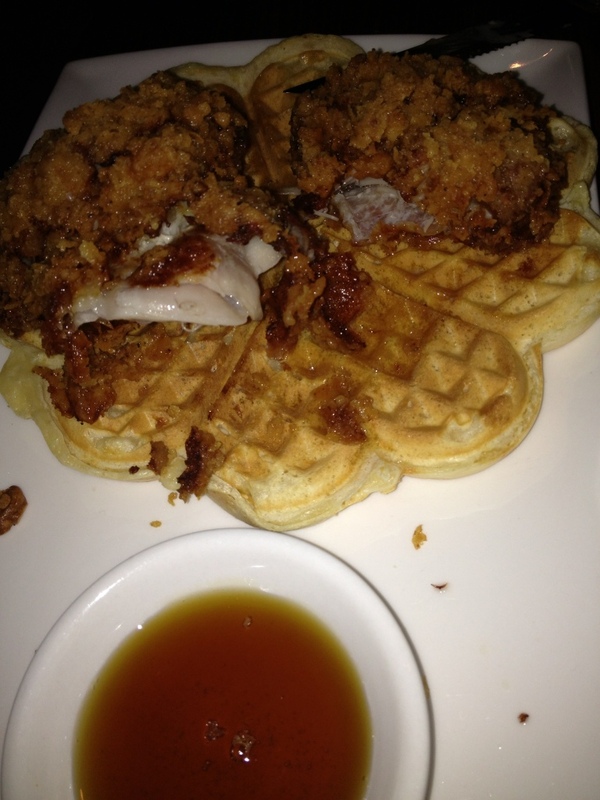 The whole point of the Chicken and Waffle scenario is the sweet, greasy, savory combo. Hollywood turned his cravings to the buffalo wings, which also didn’t disappoint. Hollywood found they had a really good hot sauce, but The Chick felt they lacked a bit of heat, clearly for those who do not see hot wings as a test of will. They were cooked well and as advertised made him contemplate ordering more. We finished up with an order of brown betty for dessert that had a good mix of crumbled buttery sweetness on top, cooked nectarines and a scoop of vanilla ice cream. Not the best of the dishes, but a pleasant ending. 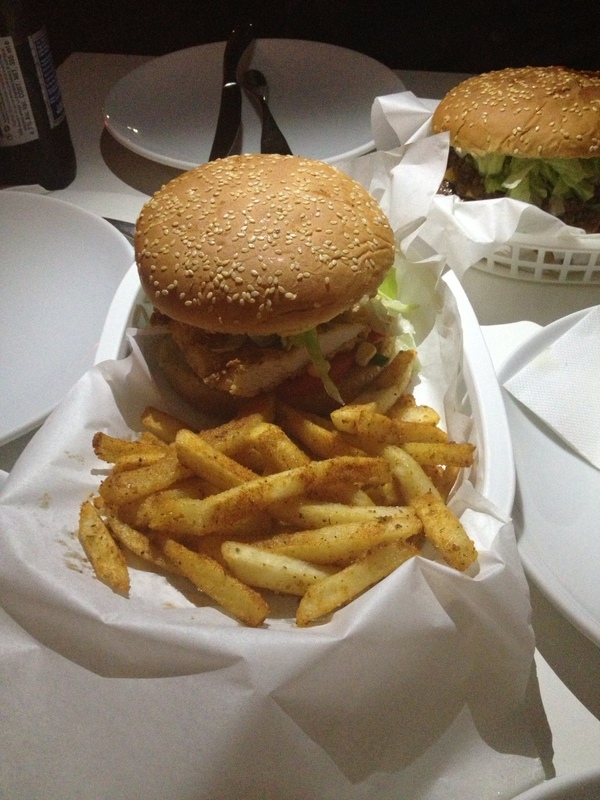 Kodiak Club is a good choice for burgers, fried chicken and buffalo wings that definitely stands out. Go there now!